Like us, our pets may need help in the form of physical rehabilitation to recover from aches, pains, and mobility issues caused by injury, disease, or simple aging. The Rehabilitation and Mobility Service at NC State University’s Veterinary Health and Wellness Center provides the rehabilitative, fitness, and pain management services that alleviate or lessen discomfort and improve activity levels in dogs, cats, and other small animals. Rehabilitation benefits pets with orthopedic and neurologic conditions, arthritis and pain management needs, and weight management issues. In addition to outpatients, rehabilitation and mobility specialists support the recovery of surgery and medical patients from the Randall B. Terry, Jr. Companion Animal Veterinary Medical Center. All rehabilitation and mobility patients receive a full assessment and a treatment plan based on individual needs, level of function, and owner and clinician expectations. 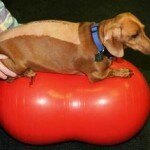 Pet owners may contact the Rehabilitation and Mobility Service directly or may be referred by the family veterinarian. On the underwater treadmill: Edie and Lilly.